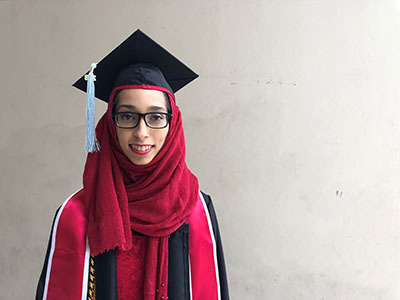 Posted Dec. 14, 2018 – Teaching major Rida Rangoonwala will lead the University of Houston College of Education graduation processional Friday in honor of her 4.0 GPA. Born in Michigan and always on the move, Rangoonwala and her family found their way to Houston. Her father’s journey from Pakistan to America, where he worked his way through graduate school, has inspired her to persevere, she said. He was the only one of his siblings to finish high school, let alone college. When it came time for Rangoonwala to apply to college, UH was her top choice – for its diversity, culture and teaching climate. The experience, she said, has exceeded expectations. Her passion for education began in elementary school and continued through college thanks to “amazing” teachers, she said. While young, she played school while dreaming of grading papers and setting up her own classroom. Years later, she said, her student-teaching experience at UH confirmed the kind of difference she could make her in her students’ lives daily. After graduation, Rangoonwala plans to relax and maybe substitute teach until the spring semester ends. Although she and her husband aren’t sure where they’re going to settle, she said she hopes to be teaching her own students come the 2019 school year. Q: Can you tell me little about your journey to graduation? A: I won’t say it was an easy journey, for me or for my family. Props to my husband for being especially supportive about us being long-distance a good portion of our relationship while I completed my degree. But, looking back on my three-and-a-half years, I don’t think I would change a single thing. Q: What is your favorite course you’ve taken? Why? A: That’s a tough one. I’ve taken a bunch of courses that I have enjoyed, but my favorite was not a teaching-related course but a core course I took for my humanities credit: Intro to Poetry. I’ve always loved reading poetry and even write a few verses in my spare time. Being able to take a class where the only work we had to do was analyze poetry in depth was like a dream come true. I read Pound and Dickinson and Plath and Frost, and these poets became like old friends to me. I could read and write to my heart’s content, and I got graded for spending my time doing things I naturally loved. Q: Has anything or anyone in particular impacted you? A: In this world I think it’s nearly impossible to accomplish anything alone. I’ve always had many people supporting me and impacting me, and they’ve all influenced me in great ways. My family, especially my parents and husband, have always supported my decisions and encouraged me. My mother actually teaches at a private school, and she took up teaching as a career shortly after I was born so I’ve had the benefit of her example. And, of course, almost every professor I’ve had during my year of student teaching has been integral to shaping my teaching philosophy. They’ve revolutionized my thinking, and I’m grateful to every one of them. A: Reading is, without a doubt, my favorite hobby, with writing coming in at a close second. I especially love fantasy fiction novels and write articles for Odyssey [a millennial publishing website], in addition to jotting small poetic verses and short stories in my spare time. Q: What is your favorite thing to do in Houston? A: I like hanging out at my local library or mall in my spare time. Katy Mills Mall is amazing, and the Fort Bend library system is also incredible. I also like checking in with events going on in downtown; Discovery Green has some amazing festivals and celebrations that are fun to check out with family and friends. I also love teaching Sunday school at our local mosque and meeting up with my friends at events at the mosque, like dinners and carnivals. Q: Can you share something about yourself? Any interesting facts? A: Well, I’m married, to a wonderful entrepreneur named Umair. I’m the introvert, he’s the extrovert and we both argue that we’re in charge! I do not like pineapples on pizza. I’m more of a cat than dog person. I like to sleep with a book next to me. I love classical literature especially by Jane Austen and L.M. Alcott. I cannot sing to save my life. I am the oldest of three and have always wanted an older brother. Ice cream is my favorite dessert (and the only dessert I actually like). I hope to teach between third and fifth grade. I also want to publish a middle-grade memoir someday. Q: What advice can you give other students? A: It would be along the same lines as the advice I gave my sister, who entered college as a freshman this year. College is a chance to do so many things and meet so many new people. Be open to new experiences and perspectives and realize that you might find yourself changing. Make sure you’re surrounded by people who lift you, and always, always prioritize. There are times for studying and times for getting into the social scene, and the amazing thing about college is being able to live with the best of both these worlds. Also, your professors are actually people who are there to help you – get to know them during office hours and don’t be afraid to ask for help or advice if you need it because they are all more than willing.